Forget everything you think you know about Patty Griffin either as a songwriter, singer or performer. With the release of FLAMING RED, her second album for A&M Records, you are about to really hear her for the first time. 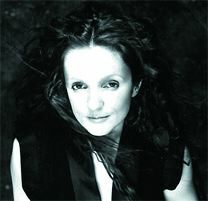 Unlikely her 1996 debut recording, the sparse, universally-acclaimed LIVING WITH GHOSTS-which was actually a collection Griffin's demos which featured her accompanied only by her acoustic guitar-FLAMING RED is an album chock full of big guitars, drums, keyboards, percussion, and her stunning, evocative voice. "What I did here was give myself the right to do whatever I wanted, to indulge every rock and roll fantasy I had and to deliver both lyrically and musically songs that challenged me as an artist. I don't want to be led around by classifications as to what I can and can't do. I'm not a kid and I want to indulge everything, even confusion"
Produced by Jay Joyce, who also provides most of the album's stunning guitar work, FLAMING RED also features one of the greatest percussionists around in the venerable Kenny Aronoff. The ensemble provides Griffin with the support she deserves in delivering what will establish her as an artist of vision and ability to be reckoned with. "I just wanted to make the record I wanted to make this time out. I love the sound of loud guitars as well as acoustic pianos and stings" says Griffin. "In releasing the demos first, I basically placed my songs in their most naked settings, but working like this, with a full band of very capable musicians, I got to look at all the kinds of music I am interested in." "What we did, Jay and I, was to give all of these songs of mine new lives , a life apart from their writing, a way to exist out in the world on their own. An the wonderful thing is, that they are all mine, they are all me-, I feel perfectly at home in singing everyone one of them because they all access a different part not only of my past, but more of my musical present and the restlessness I feel in trying to express myself and say what I need to say." "I am looking for the song to reveal itself to me, and these songs have taught me a lot about them. I wrote many of them while discovering the ins and outs of this business in the last couple of years and they reflect all sorts of emotions, from tenderness to anger, and then there is the side of my personal life that comes out in there too, the side that needs to discover what it's all about for me in living this kind of life. They are all emotional, all coming from the same well." Griffin has a busy summer planned, touring with a full band instead of just her guitar. The next year will find her headlining her own dates as well as being featured on this summer's Lillith Fair, she will be reaching an ever widening audience while surprising and delighting existing fans. FLAMING RED is an album that will challenge and amaze, and more than likely push her into the limelight as an artist who sees the magic in a song and tries, by whatever means necessary to find it and make it her own. PATTY GRIFFIN'S FLAMING RED IS OUT ON A&M RECORDS -JUNE 23,1998. Man said 'Woman I'm a little tired of you"
And she said "Don't leave me baby I'll do anything you want me to"
And he said 'Can't you do something about the mess around this place"